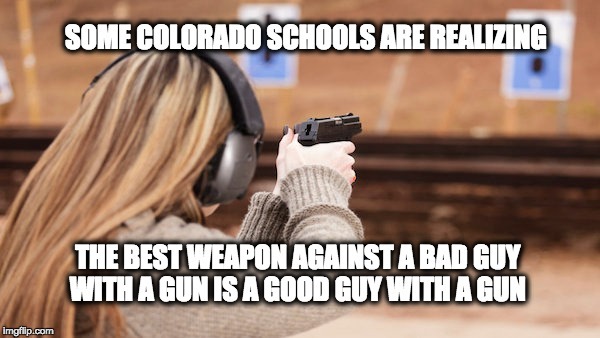 Some school districts in Colorado are finally realizing that nothing stops a bad guy with a gun faster than a good guy with a gun. They are beginning a program to train school employees to carry guns as first responders in their schools. Under current Colorado law, school staff members with permits can carry concealed guns in school so long as they have been designated as a security officer. So this week, educators are preparing to become security officers by heading to the gun range for specialized training. “They will be taught by the ‘Faculty Administrator Safety Training and Emergency Response’ group or FASTER, for short. “The ‘FASTER’ group was founded in response to the devastating 2012 Sandy Hook school shooting in Newtown, Connecticut. Once the educators complete the program they will be able conceal carry their guns into the schools and protect students if necessary. Generally the school districts participating in the program are in rural areas where it would take over a half an hour for the local law enforcement to arrive with help. Sadly Colorado has suffered through two major mass shootings in the past two decades, the Columbine High School massacre where two students killed 13 classmates, and wounded more than twenty others before turning the guns on themselves; and thirteen years later when James Holmes entered a movie theater in Aurora, Colorado and began indiscriminately firing into the crowd killing 12 people and wounding 70 more. The idea for putting armed responders in school was first proposed after Columbine by President Bill Clinton. In April 2000 as part of his commemoration of the first anniversary of deaths at Columbine High School in his weekly radio speech President Bubba announced $120 million in grants, much of it for a program to place police officers with guns in schools. Since that proposal was made, there’s been debate over the possibility of arming school teachers or hiring armed guards to prevent further mass shootings. The argument by many is that “gun free” schools do nothing to deter mass-murderers from committing whatever horrible acts they wish. The lack of firearms on school campuses only serves to entice the crazy killers to use the schools as targets, knowing they cannot be confronted with equal weaponry. And as explained above, in rural Colorado areas many schools are to far away from law enforcement to stop an assailant quickly. This program seems reasonable, requiring training approved by local law enforcement, then allowing a school employee to carry a concealed weapon to use only if necessary. It is a certain improvement over allowing children to fend for themselves if someone shows up bent on committing a massacre.